Hi everyone! How was your weekend? It was a little cold and overcast around here. But I’m thankful for every drop of sunshine I can get on the weekends. I’m definitely not missing the rain. We had a quiet one and spent a little bit of time outdoors, just the hubby and I. 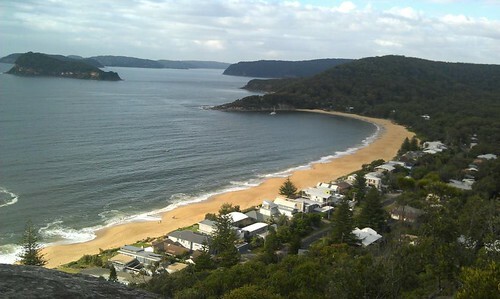 We went bushwalking and strolled along the beach. The cool weather kept most families away but the die hard swimmers were not put off by the cold water and there were weekend fishermen along the rocks trying their luck. 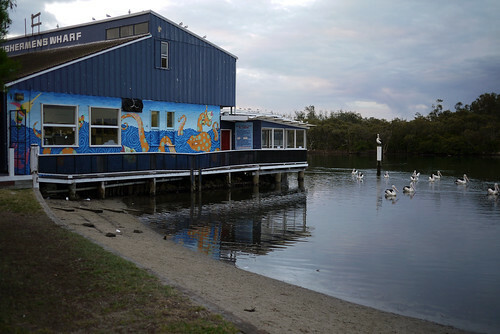 The café near the beach was, however, bustling with families having brunches and boy, the coffee aroma was so terribly tantalising! Although I do miss having a proper cup of coffee every weekend, I was good and stayed away. I already had my daily dose of caffeine that morning. 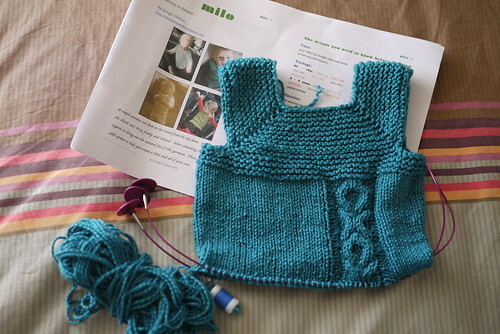 Anyway, I had grand plans of showing you the Milo vest (pattern in Ravelry) I’ve been knitting on and off. I thought I would have it finished by now but I had a little problem with it and have lost interest in it. You see, I didn’t check my gauge. I intended the vest to be worn from newborn to 3 months but because of my lazines, the vest is too big! The chest size will suit a 6 month old and older. Argh! It isn’t the end of the world of course. It just means my baby girl will only get to wear it late Summer or Autumn next year. So as you can imagine, I’ve lost motivation to finish the vest right now. Instead I’ve been pottering around with other things. Pretty sweet things to be exact. What do you think? 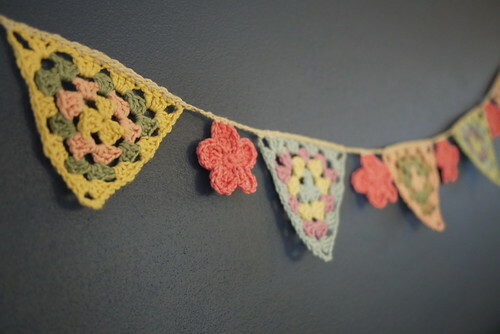 Are you in love with this granny bunting as much as I am? I’ve got a toothache just looking at it! It was so quick to crochet and I added the little flowers to make it even sweeter. I have it hung over my TV in the living room at the moment. The colours really stand out against the dark blue wall. 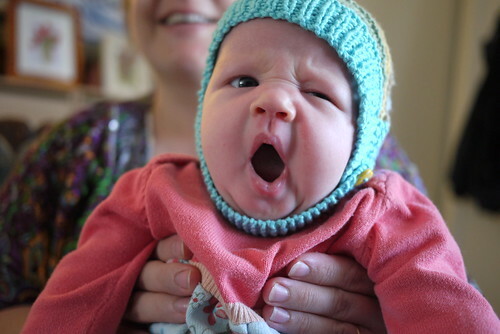 I think I’ll have to crochet another one to hang over the crib in the nursery. Yes, I think I might have to do just that. Notice that I’ve got Letters and Numbers on the telly. I love that show! Do you? I am truly amazed by the skills displayed on the show. How do they work out the letters and numbers so fast? I hope watching it will let rub some of that cleverness onto me. P.S. Ecoyarns have pledged to support Tree Henge with a percentage of its profits. 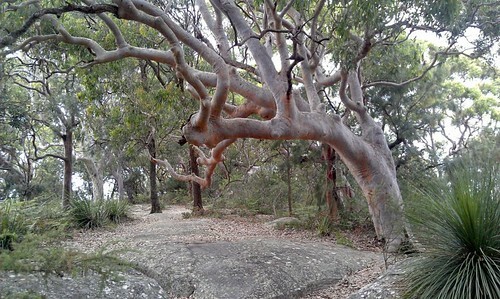 All money raised from Tree Henge is put back to restore life to Australia’s natural environment. Thank you for helping Ecoyarns support this worthy cause! I have to be honest. I don’t know much about keeping babies warm in winter. I grew up in Singapore and all we had to deal with are heat and humidity all year around. With my little girl being born in August, I do feel a bit daunted about keeping her comfortable in the cooler months. 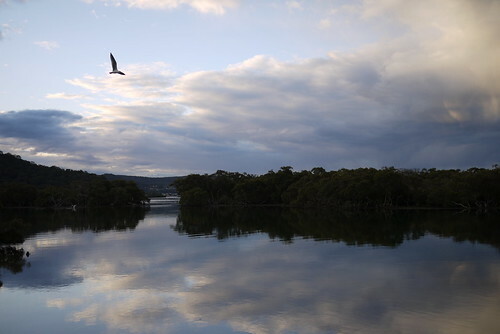 Even though winter around Sydney is mild relatively to other parts of the world, I personally struggle with it at times. So naturally it does my head in trying to figure out the most suitable knitting and crochet clothes to make for my girl. 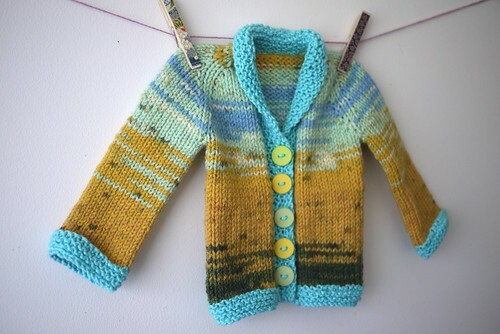 I blogged last week about the rather warm jacket I made for my baby girl. I thought it would be suitable to rug her up in it if we go for an evening stroll by the water. Doesn’t the orange and blue colours of the jacket remind you of sunsets over a river? I can just imagine us walking along together and watching the birds head home. So what if the evening was extra brisk and the wind was picking up? I didn’t want my girl to have a cold head! 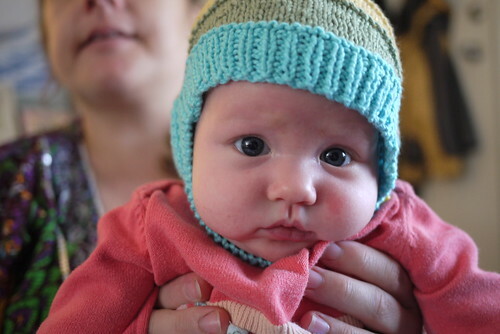 I searched through Ravelry for baby hats and boy, there are a LOT to choose from. I was certainly spoilt for choice. I did pick two hats to knit. 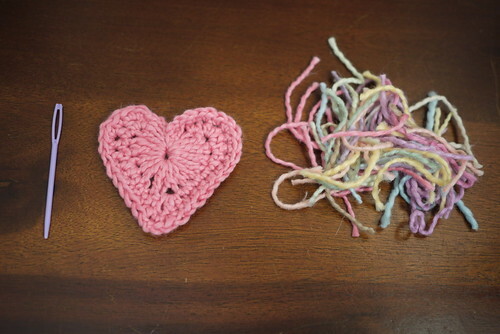 They’re different from each other but both knit with EcoOrganic Cotton. I simply cannot ignore how comfortable this cotton is for the mild winter around here and the colours… Oh, let’s not get started on the beauuttiffuuulll colours! The camera clicks away and she patiently waits for me to show off the pretty hat. She does not mind one bit that she had the hat on her head. That’s a good sign! 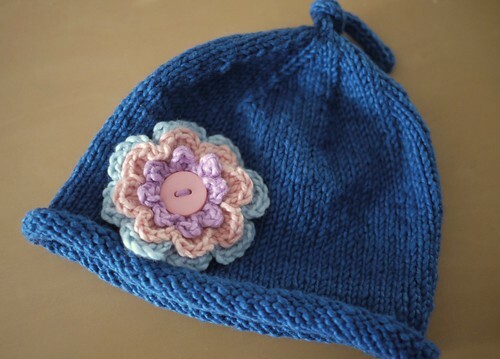 The next hat I knit is a bit unconventational for a baby girl because I knitted it in a dark blue colour. 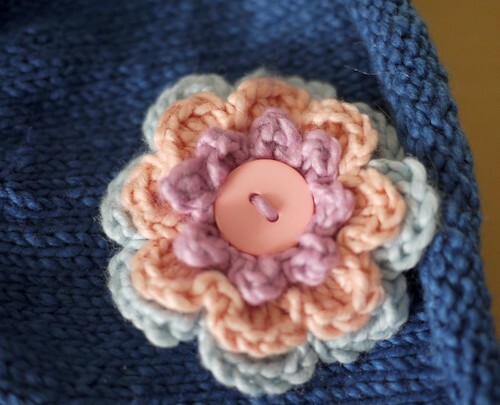 But I did make it girly with a crocheted flower embellishment. It’s a Simple Baby Hat (free pattern) and I tweaked it a tiny bit by knitting an i-cord before casting off. I think it looks cute with the little tail on the top. No pretty model to show off this hat for me unfortunately. I think it still works for a girl. I’ve been doing quite a bit of window shopping for baby clothes and I’m often attracted to the clothes that are multi-coloured. The plain pinky ones are nice too but I think mixing that up with lots of colours make the outfit much more fun, don’t you think? I love this crocheted flower. There are many crocheted flower patterns around but I think this one was super cute and the size just right to dress up a boring hat. The flower pattern is available for free too! Got to appreciate those generous, creative people out there. Well I got to run. I’m studying part-time and I have an assignment due in a couple of days. Eeek! Have yourself a fabulous week and catch up with you soon! P.S. Have you subscribed to our blog? No? Then what are you waiting for. Don’t miss another blog post. Add Ecoyarns blog to your RSS right now. A couple of my friends, who I met through Ravelry (Yay Ravelry! ), have had babies just weeks from each other. I had them over the other day for morning tea and it was such an experience to have the babies meet one another for the first time. There was a bit of fussing and unsureness, and at times, their crying would set the other one off! Fascinating to watch. But I think it was just good to enjoy banana bread and tea and catch up again after so long. Everyone’s been a bit busy with being pregnant and having babies. You know what it’s like. Now what’s that got to do with knitting I hear you ask. Well, for starters, I’m pregnant too! Isn’t it weird how a friend’s or colleague’s pregnancy could increase your own fertiliy? We’re over the moon as it is our first and we just found out yesterday we’re having a girl! 🙂 Yay! So… over the last few weeks I’ve been knitting for my own little budle of joy who is due in August. 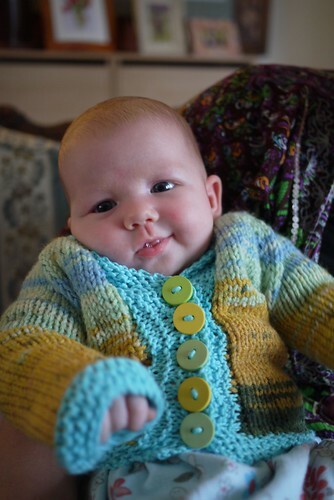 I love the Baby Sophisticate pattern and had it stored away in my Ravelry favourites for awhile now. 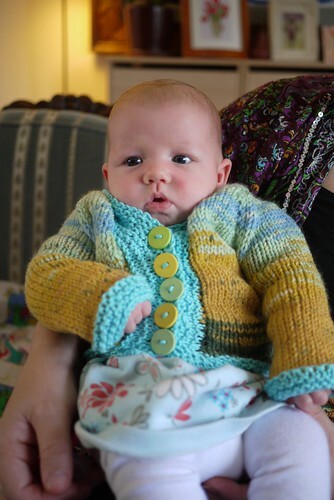 I didn’t know that it was going to be a girl when I knitted this so I kept it as gender neutral as possible. What do you think of the jacket I made? I love the colours on it. It’s so unlike anything you’ll find at the shops. I used a Moda Vera yarn I bought at a Spotlight sale last year for the main part of the jacket and the lovely bright blue collar and edge trims are none other than EcoOrganic Cotton. The colour is aptly named Peace. 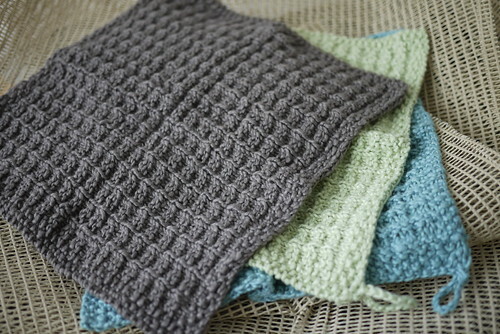 I wanted a soft and gentle yarn against my baby’s sensitive neck and you can’t go wrong with EcoOrganic Cotton. For the life of me I cannot remember which Etsy store I bought those cute buttons from but they’re just perfect for the jacket I think. My friend, Vanessa, was kind enough to loan me her beautiful 8 week old daughter the morning she was here to model my baby jacket just for YOU. Her first modelling job and I think she did a spectacular job! All together now… Awwww…. Isn’t she just precious! 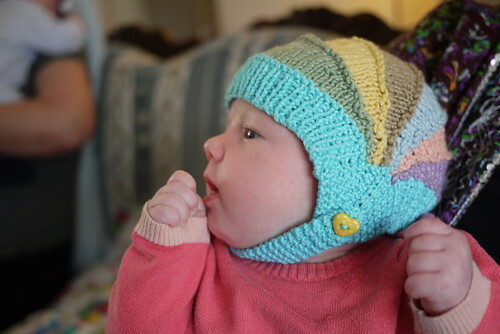 I also made an equally colourful baby hat to match this jacket but you’ll have to wait until next week for that one. 😉 Enjoy the rest of your week! Summer is officially gone and autumn has greeted us with devastating floods throughout many parts of New South Wales and Victoria. We are safe here where we are but nonetheless we are touched by what we see on the news everyday. Our thoughts are certainly with those badly affected by nature this last week. I feel even more blessed to be able to continue my life quite untouched by the heavy rain elsewhere. I am knitting regularly now and I’m in a happier place than I was in the miserable cold summer. Reality and my expectations of what autumn should be is matching up. My brain is at ease with that. So let’s continue where we left off last week. I showed you the pretty potholders I crocheted while trying to get my crafting mojo back. It still brightens up my day whenever I lay eyes on them. Such simple pleasures when you create something yourself. 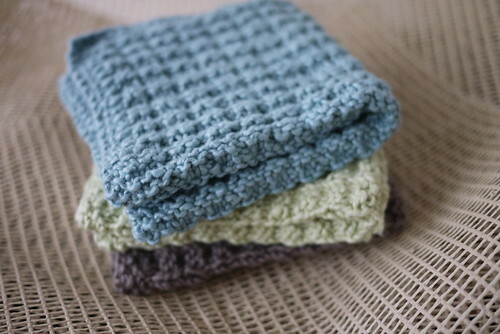 I also wanted to make something to show off the softness of the EcoOrganic Cotton. They are just so lovely against the skin. Well, it’s a no brainer really. I made facecloths! I so, so wish you can touch these! Oh EcoOrganic Cotton, how I love thee! ETA: I almost forgot to tell you that Ecoyarns actually has 10 different types of cotton yarn to pick from. Ten! I have also tried Pakucho organic cotton but not the rest. Interested to see how each one knits up. So many choices, so little time!